Wether or not you have been reading my previous posts of island hopping from Phuket to Koh Lanta, and to Koh Mook, Koh Lipe and Langkawi, in this travel blog update you can read how my travels continue. After a short stop on Koh Lipe I take you to the more remote islands of Ko Bulon Leh, Ko Libong and Ko Jum (also called Ko Pu). They are all located a bit off the beaten track in the Andaman Sea. Read on to experience this adventure with me! First, back to Koh Lipe! Whilst boarding the ferry in the Telaga Harbour on Langkawi Island in Malaysia, I was looking forward to go back to Thailand. 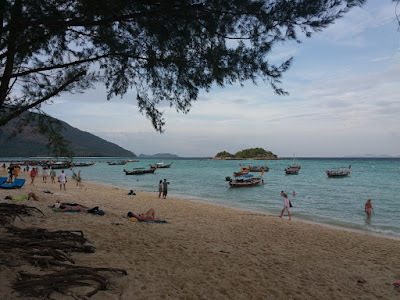 My first stop was going to be on Koh Lipe again, since I needed to get a new entrance visa at the Thai immigration office there anyway. Coincidently my ´Corralejo friend´, Andy from Germany, was there at the same time. We actually realised we never really met before although we both used to work for Ben & Rachel. He as a windsurf instructor, me during my evening job in the Sol & Mar. We shared stories and memories about Corralejo, located on the Canary Island of Fuerteventura, together with some nice cold beers. Oh I realised I miss Corralejo but also I´m extremely happy to be travelling again. I can always go back there and one day I might do so! It was a fun night and we forgot to take a picture for our Corralejo friends! 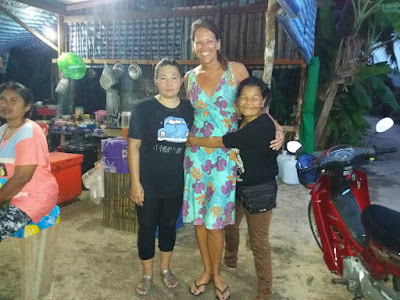 This time my stay on Ko Lipe was not much more than a quick stopover, but you can read here more about the scuba diving on Ko Lipe and in this article you can read about my stay on the island of Koh Lipe. 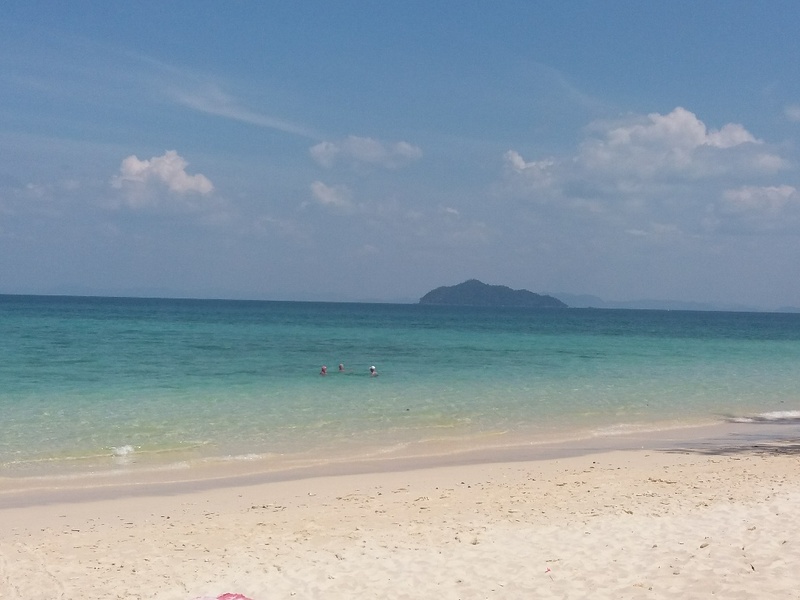 The secret island of Koh Bulon Leh: a dreamy paradise! So soon after that, I moved on to the island of Koh Bulone Le. Located at only an one-hour boat ride away from Ko Lipe you find this unspoiled, hidden paradise. 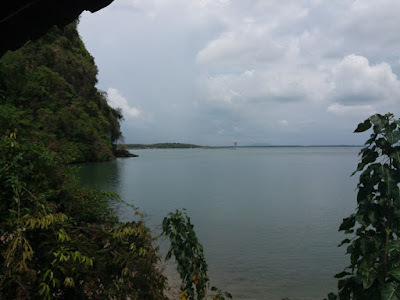 What a great island, I still totally love Ko Bulon Lae! It reminded me a lot of Koh Mook due to the jungle forest, no cars and untouched, slowly atmosphere. This place is even less touched by humanity than Koh Mook and I had a very nice quiet time here. Amazing! There´s no luxury at all, the internet didn´t work for 3 days and electricity only runs at night. 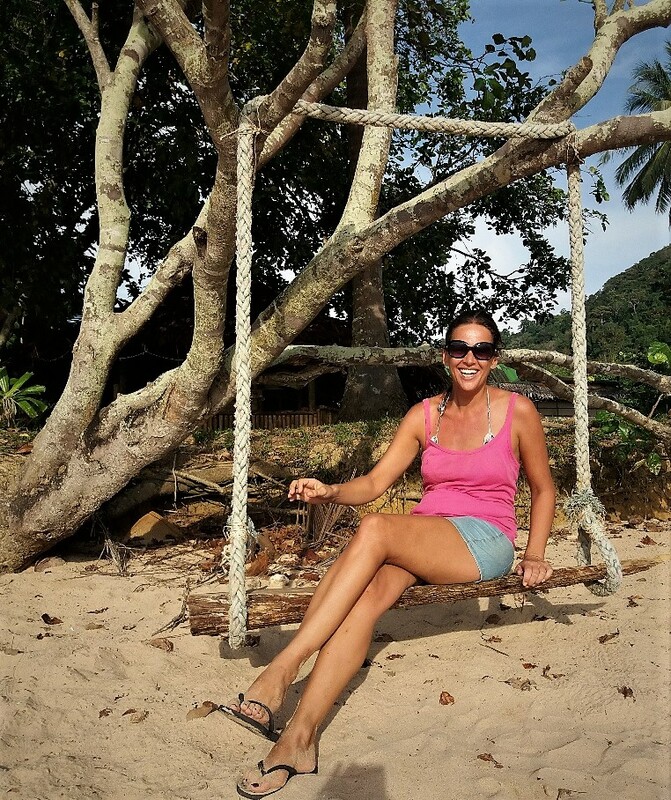 I didn´t really meet other travellers here, in the sense of spending time together, but had a good laugh with the people working in the place I was staying and enjoyed myself by doing some jungle hikes and relaxed at ´Maldives-style´ beaches. Serious, the beach there felt almost of being back on the Maldives! There is actually a hiking route pointed out taking you over the whole island, crossing through the jungle, a small rubber plantation and some places where local people are living. What an island, it´s like a dream there. Maldives? No, this is Koh Bulon Leh! For a couple, I think it can be a very romantic island and there are also many options to go camping. The funny thing I discovered there was that the local school rents out bungalows and for a pretty good price too, if you´re interested in going there. 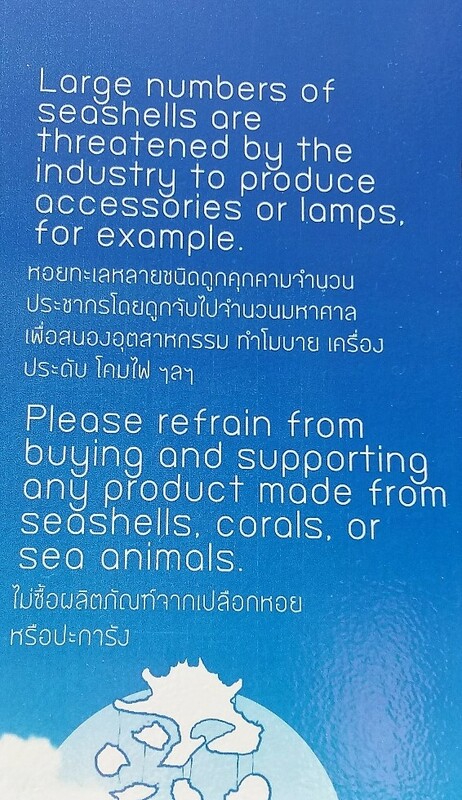 One beautiful thing I saw was the awareness to keep corals and nature in tact. 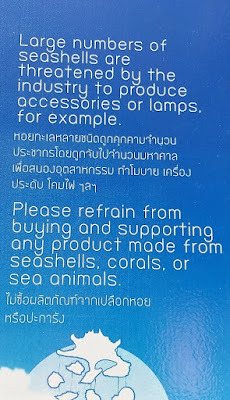 After being on islands overloaded with tourists, I found these kind of information boards (suggesting how to keep corals healthy and how to prevent damaging the marine life) on an island with hardly any tourists! I was very surprised to find it there, but it made my heart smile again! Confused about the name of this island? Ko Bulon Le, Koh Bulone Lea, Koh Bulon Leh, or simply Ko Bulon, it´s actually all the same. 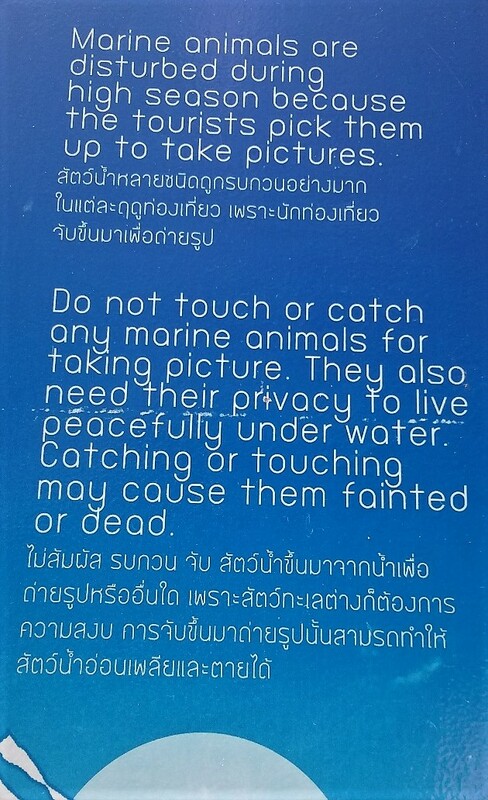 Just the way the Thai people like to spell certain islands in a million different ways. Monkeys outside the hostel at Ko Libong! From Koh Bulone I went on to the island of Koh Libong. 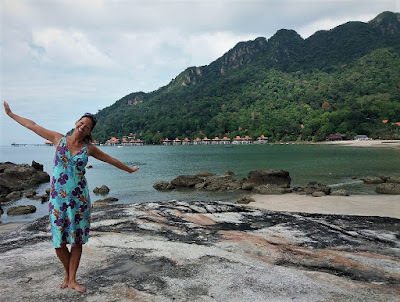 Ko Libong is home to dugongs (sea cows) who are living there in the bay, but unfortunately I pretty soon figured out that it´s not possible to dive or even snorkel with these amazing marine creatures I never saw so far in my life! Still on my bucket list though, even after working as a diving instructor on the Dominican Republic, where the Manatees were seen on a regular base, I never saw one! I could go on a boat to spot one from the service but after I was also told that lately they didn´t really see them I decided not to do that and wait for another time in my life when I actually will be able to dive with them. I stayed in an accommodation called Libong Sea Breeze Resort, which I can highly recommend! The place is run by a Spanish family and it was great! I love the fact how the whole family, including the two kids who spoke fluently English, were all helping to run the place. Also, on my first morning I went back to my room after breakfast and heard something outside. When I looked out of the window there was a whole monkey family eating the bananas from a banana tree. Amazing! 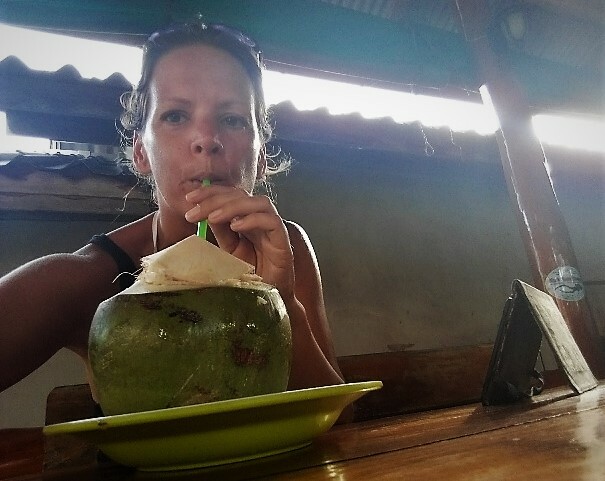 Unfortunately, I got a bit sick on Koh Bulon and was still not feeling very well during my first days on Ko Libong. I spent a lot of time in bed and survived on spicy noodle soups with vegetables to kill the fever I thought I was having. I was sweating and shivering, so not much fun. But on my last day I felt completely fine again and decided to get the most out of it. 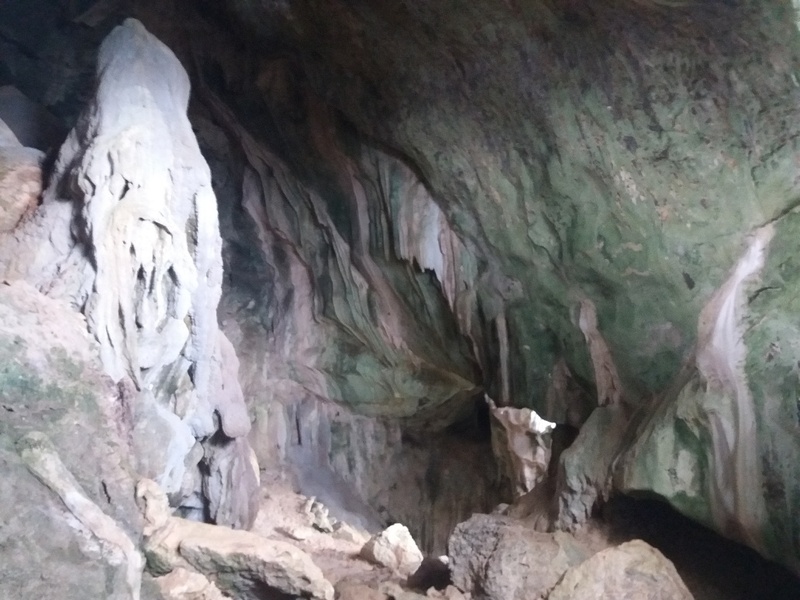 An amazing cave to explore on the island of Koh Libong! Together with another guest, Martin from Poland but living in the UK, we went on a hike up to a cave and a viewpoint. It was an amazing experience! I´m so glad I met Martin because he had explored the cave before and I would never have found it by myself. 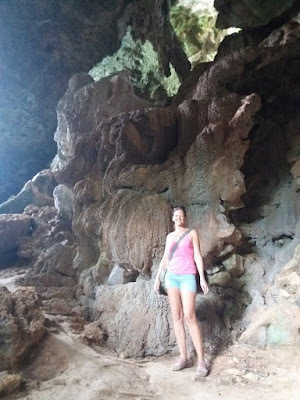 So, in the middle of the jungle, there is this huge cave which you can almost completely explore! 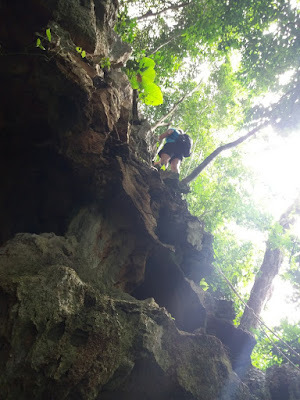 Some parts were a bit scary, there´s a rope attached where you can hold on to whilst you climb next to a drop off into the dark. But most parts are much easier and you can just walk and climb through. It took us about 20 minutes through the cave before we reached a viewpoint and there was tiny wall outside, around the cave, next to a steep drop off with another rope attached to hold on to. Question marks!? We both decided not to risk it. That was too much. So we went all the way back to the entrance where you can go the other direction and if you continue there you arrive at the other side of the same wall with the steep outside part. My travel companion decided to do it, I felt way more comfortable by just waiting for him, haha! 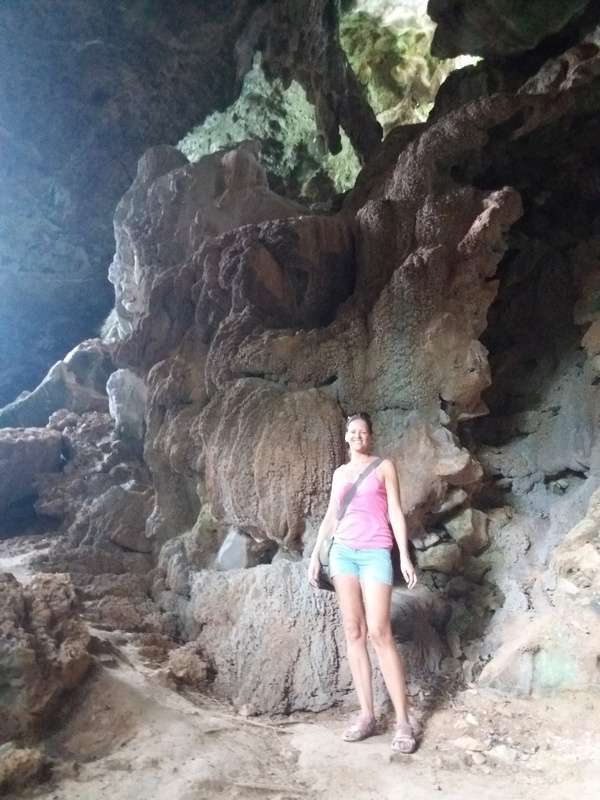 I love depths (in the water) but are not very good with heights and was already shaking whilst doing some parts inside the cave! I didn´t regret skipping this part! After that we went to the old Dugong viewpoint, just a platform overlooking the sea where we had a rest. When we saw a ditch black cloud coming our way and already could hear some thunder in the distance, we decided to make our way back to the Libong Sea Breeze Resort. We arrived in time and later it turned out that this cloud didn´t arrive till just before night time. When we were back, we decided to still go and chill out at the beach where we met with the Spanish family. I enjoyed a very refreshing swim after our well sweaty hike and climb. The Libong Sea Breeze Resort also has an onsite restaurant. The Spanish couple together with the Thai guy running the place, have built an oven in the garden in which they make pizza and barbeque things like fresh fish. I enjoyed a delicious vegetarian pizza that night, which was very nice after months of mainly Asian food. The food got served on huge banana leaves as plates! But even better was the vibe in this place. The Thai guy was doing some entertainment, playing guitar while all people somehow mixed together and shared dinner. But the highlight of this evening was when I started to have the giggles and just couldn´t stop it anymore. I was sitting on a table with my travel companion for the day and two girls from Germany. Three, big (very muscular) and very serious looking, guys from Czech Republic arrived at a table further down. I heard the Thai guy having a conversation with them but wasn´t really listening although out of sudden I only picked up: “Nooo, no, you don´t look like a rabbit, you look more like a cockroach.” I nearly spitted the bite of pizza I just took all the way over the table when I heard that and I burst out of laughing. Who says that to a guest!? And why? The funny thing was that the Thai guy was constantly having a huge smile on his face himself and was just making everybody smile, except of these new guests. They didn´t laugh about his jokes and were having faces like question marks. Every time I looked into their direction or in the direction of the Thai guy I started laughing and giggling again and I just couldn´t stop it. And no, I wasn´t drinking here. Not yet, at least! At some point the other tables around us started to notice what actually happened and more giggling started to develop around the whole place. But still I had a big question, why did he say that!? About two hours later I found out after begging the Thai guy to tell me where that came from. So he told me that he was explaining that they have pizza and fish with salad for dinner. Then, one of the guest said: ”I don´t eat salad, do I look like a rabbit!?”. That´s how it all started, what a laugh. I still start laughing when I think about it now and my cheeks were painful even in the next morning. 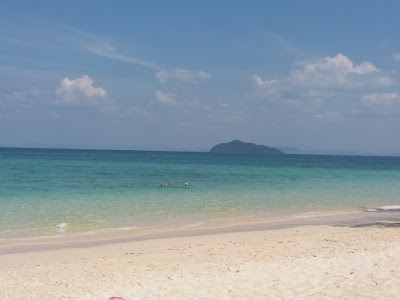 By the way, if you considering of going to Koh Libong, book your accommodation well in advance. Because it´s away from the mass tourist stream there are also only a handful of accommodations. You can book in advance with booking.com. But that morning it was time for me to leave Koh Libong and to continue my trip to Koh Jum. Again another island I love due to it´s quietness. 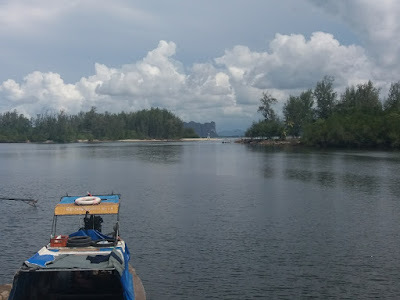 All the islands I have done after Langkawi: Ko Bulone Le, Ko Libong, Ko Jum, they are all a bit off the beaten track. But only a bit! Most people go to Koh Phi Phi, Koh Lanta, Koh Lipe but all these boats go as easily to the more quiet islands but somehow not much people go there. And so on all the islands in this article I encountered nearly empty beaches and such a small amount of travellers. Still enough to meet some other people, but away from the main stream- I also loved the real interactions with local people I had. .
Yummie food on the island of Ko Jum! I arrived with quiet a delay due to bad weather, it has been raining almost all day and I was even cold upon arriving. There was nothing to cover myself with, I left my jacket in Nai Yang Beach! It was almost evening when I arrived so I just wanted to find something to eat not too far away. Opposite my accommodation, Koh Jum Hostel, was a local area with only a few streets and I decided to have a look there first. I crossed the street and the first street to the left, I found such a good place to eat with the most lovely people. 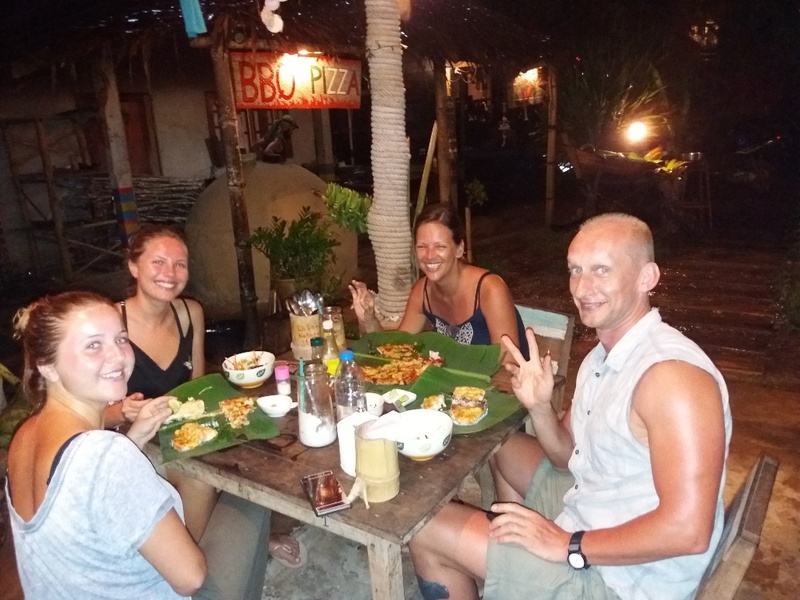 After my first meal there, I felt like a friend already and I have been back there every single day during the rest of my stay on Koh Jum. After my first dinner, the lady owning the place realised I was vegetarian and everyday she already told me what she could make me the next day and every time it was something else and just delicious. And every single day I was looking forward to my dinner and have a chat, using Google translate, with these lovely people. I even got a room offered in the house of the lady, for my next stay on Koh Jum! 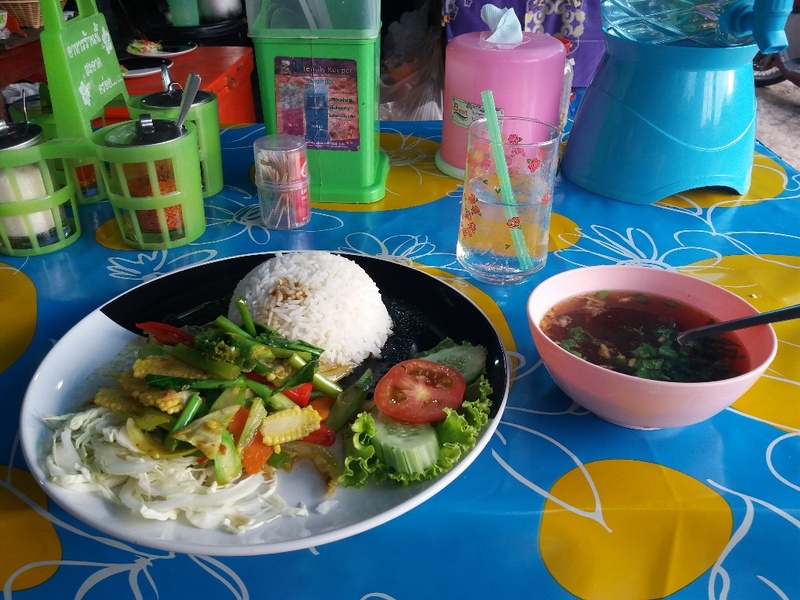 And for every meal, no matter if I had a soup first, then a main dish and a few cups of water, they charged me 40 Baht which is let´s say 1 Euro. The beaches of Koh Jum were nearly empty and also the streets crossing the island. 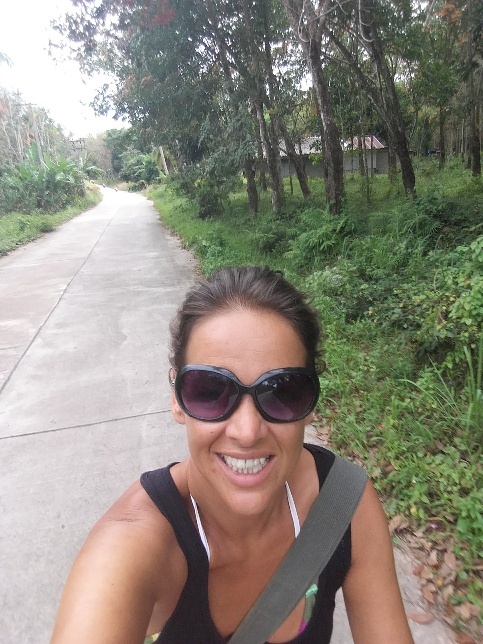 One day I rented a bicycle and explored the island this way and also went to the local village close to the pier just to soak up the vibes: quietness and relaxation. And that´s actually what I have been doing on Koh Jum during all my 4 days I have spent there: quiet relaxation. Biking around, going to the beach, doing some writing and enjoying the lovely dinners. 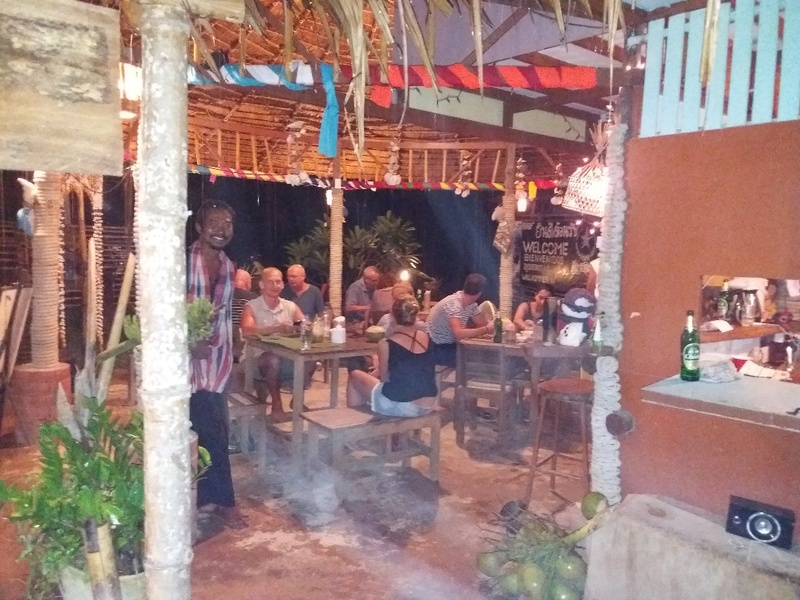 My stay in the Koh Jum Hostel was also very pleasant, with a good price – quality rate and being super clean. Then the time had arrived for me to go back to Phuket. At this time I already decided that I wanted to extend my visa again so I need to plan in another, this time more prepared, visit to the emigration office in Phuket Also, my dive gear was still with Manfred in Nai Yang Beach and he also had moved his dive shop to another location. So time to visit the place where it all started and I´m still so grateful that Manfred suggested to me to come and dive with him. I´m just so happy every single day that I´m travelling again and living my dreams. Although I have no clue where I will be next month, things come along every time with my friends having or running dive centers all around the world. I got asked to come over to the Philippines to dive with two different people on different locations, but also having plans to visit the island (Veligandu) on the Maldives where I used to work in 2010 and scuba dive Rashdoo again. But then I was also in touch with Leah, my friend in Australia, to meet in Bali. So everything is possible right now, although my dream is to go to the Pacific at some point and I´m still convinced we should believe in our dreams! In my next travel blog update you can read more about my stop on the islands of Koh Phi Phi, my stay in Phuket and Nai Yang again before I return to do some scuba diving on the Phi Phi islands. Also I came to stand still for a few weeks to catch up with a lot of writing and even continue with my book. Here, I met a bunch of other diving instructors who made my stay absolutely unforgettable. After being also a bit isolated during the island hopping, this was just the perfect place for me to do a lot of writing in the day time and hang out and socialize in the evenings. Even though sometimes we enjoyed the Leo-beers a bit too much! I also came across the partner dive center of Adang Sea Divers, where I dived with on Koh Lipe, and I just felt in love with their concept. They are involved with some amazing projects in regards to recycling, but also help and stimulate local people to dive and are awarded by many organisations and are even a Shark Guardian Centre. Stay tuned for my next article about that one. 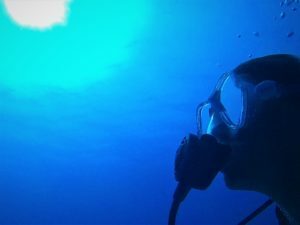 The one about the diving with this dive centre, called Blue View Divers, is already online and you can find it here. 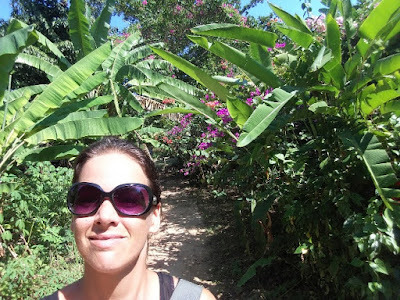 Also, you can click on this link for an overview of all my travel blog updates. For an overview of all articles about island hopping the Andaman Sea, click here. Or sign up for my mailinglist by scrolling down to the pink part! If you´re Dutch and prefer to read in your own language, then that´s possible too! Click here for my Dutch website.